The importance of building a talented, reliable, well-trained sales team can’t be overstated. Regardless of your business’ size, revenue, or industry, you need great salespeople to support your business as it grows. Why? Because with better sales reps, you can land better customers. Before you can conquer the business world, you need to figure out how to hire, compensate, and scale a sales team. 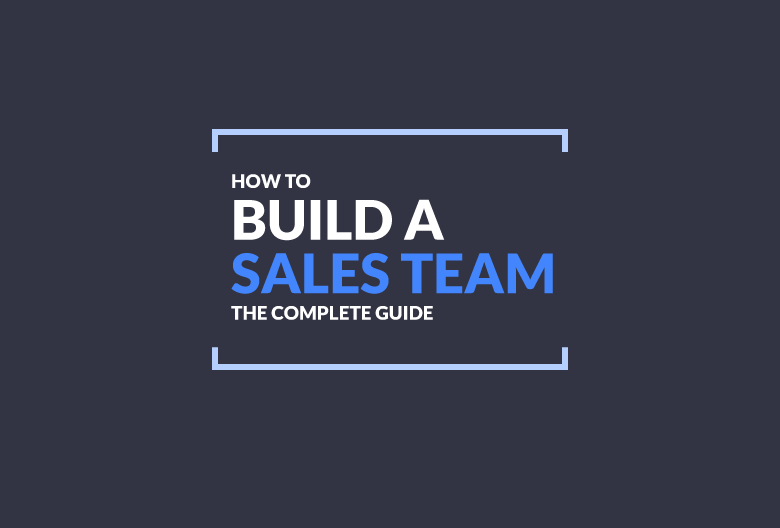 This guide is designed to help you with all aspects of hiring and building a sales team, including what to look for in a candidate, how to interview, when to expand your team, and how to create a payment structure that attracts, motivates, and retains top talent. Building the right sales team allows your business to thrive. However, when you’re running your own startup, it’s not always clear when your business is ready to bring on a dedicated sales team. This is especially tricky in the early stage of a startup, when the job of selling falls on the founders (along with pretty much every other imaginable duty). So, how do you know when it’s time to make that first sales hire? If your business checks all or most of these boxes, you might be ready to start building your sales team. Let’s dig into the steps you should follow to build an efficient, successful sales team. The individuals you hire are the building blocks of your sales team. If you don’t hire top sales reps who mesh well with your company’s goals and culture, you’ll experience more turnover, incur greater hiring costs, and struggle to grow your business. First things first, decide what type of salespeople you need to hire. This applies to specific skills, traits, habits, and experience levels, but also to the specific type of role you want to fill. That is, do you want to specialize your sales force or stick with a team of generalists for the time being? Your hiring criteria depends on which role (or roles) you’re hiring for. If you’re working with a small tight knit team, your first sales hires should be comfortable wearing a variety of hats. So, rather than looking for a director of sales or an account executive, you should aim to hire someone who can sell and is comfortable adopting different roles based on the situation. Then, as your business scales, you can consider hiring a range of specialized sales professionals who excel in their specific role. Specializing (when the time is right) allows each team member to focus on honing their skills and become superstars at what they do, rather than just okay at everything. Inside Sales Rep: The heart of your in-house sales machine, inside sales reps are likely responsible for the majority of your sales. They spend most of their time selling and following-up via phone and email, rather than meeting with prospects in person. If you’re an early-stage company, inside sales reps are likely the first type of sales hires you’ll want to make. Outside or Field Sales Rep: These are the free-range members of your sales team. They’re typically assigned to a specific territory location and likely spend more time on the road than in the office. Since your inside sales team can handle a range of accounts and territories remotely, you might not need outside sales reps just yet – unless you’re pitching to enterprise-level companies who require in-person demos to close. Sales Development Rep (SDR): An SDR’s primary job is to find qualified sales opportunities and schedule as many meetings and demos as possible. They spend the bulk of their time cold emailing and cold calling. A great SDR ensures your inside sales reps and field agents have a steady stream of qualified opportunities that match your ideal customer profile. Account Executive: A quota-carrying member of your sales team responsible for managing existing accounts, account executives research your prospect’s goals and pain points and then come up with offerings tailored to each prospect. Account executives also consult with prospects, negotiate contracts, and identify opportunities for upselling and increasing revenue. Sales Engineer: Part engineer, part sales rep, sales engineers are also known as pre-sales engineers and solution architects. They understand the technical ins and outs of your product or service and they know how to sell. This makes sales engineers the perfect liaison between clients and sales teams for companies that sell high-tech or complex products. They also deliver customized demos to qualified leads highlighting how your solution solves specific problems. The information you include in your job listing shouldn’t just tell candidates what their job title would be or how many years of experience they need to have. If you want to attract top salespeople and build a winning sales team, you should put thought into crafting a job description that speaks directly to the people you want to hire. Create a listing that describes the ideal addition to your team. Mention the skills and type of experience you want your new sales rep to have and be as specific as possible. If you’ve already got some awesome sales talent on your team and are looking to expand, write the job description as if you were trying to rehire your top sales rep all over again. What traits do they have that make them so successful? What could you mention about the role or your company that would entice them to apply right then and there? Your time is valuable, and your schedule is likely packed, which is why it’s so important to screen candidates before scheduling interviews. Once you have a preliminary list of potential candidates, screen them with a quick phone call or written task. It should only take a ten-minutes call to get a sense of each candidate’s charisma, ability to think on their feet, and ability to build rapport. This saves time and money by helping you identify top candidates early on in the process. Another option is to email them questions as a written screen instead. This allows you to see the candidate’s written communication skills and professionalism. Plus, the amount of effort they put into the written screening reveals how interested they are in the job. While the initial phone screen should be brief, the full interview is more intense. The interview process should involve at least two members of your existing team to cancel out any biases and ensure the right candidates are chosen. Ideally, you should create a repeatable interview process so that you have consistent benchmarks to compare current and future candidates against. For example, use the same set of questions during each interview (though this might vary depending on the role you’re hiring for) and create standardized evaluation procedures. One simple solution is to give every interviewer a scorecard to determine how well each candidate fits the description of your ideal sales rep. Everyone on your team should use the same scorecard for consistency. Ask questions designed to tell you about the candidate’s skills, personality, and drive. For example, how do they respond to objections? What negotiation tactics do they use? What motivates them to close the deal? If you’re in the SaaS industry, do they have the technical knowledge to understand and sell your product? Keep in mind that hypothetical questions are helpful when you’re interviewing entry-level candidates without much hands-on experience. Veteran candidates, on the other hand, should be able to answer a mix of hypothetical and experience-based questions. Finally, consider using mock demonstrations as part your interview process. Whether it takes place on the same day as the on-site interview or between screening and the interview, a mock demo gives candidates a chance to wow you with their presentation skills. There’s nothing worse than pouring time and resources into hiring sales talent only to hire someone who’s not a great fit. So, after you’ve held several interviews, have an open discussion with everyone who spoke to the candidates during the process. When you find the salesperson (or salespeople) you want to hire, the tables turn. Now it’s on you to sell the candidate on why they should join your team. Call them up to offer them the job. You can do this over the phone and then, once you have verbal acceptance, follow-up with a formal written offer. Since you want to entice top talent to join your team, you should also use this opportunity to highlight the benefits of working your organization and tell them about your team dynamic. If your top choice comes back with a counter offer or asks for extra time to think things over, be patient and appreciate that negotiation is all part of the sales process! As you can see, building a kickass sales team requires quite a bit of time and resources. So, why would you risk letting any of that effort go to waste? Businesses that don’t provide adequate resources and training when onboarding new hires are doing just that. Tools and resources should be ready and waiting before your new employee arrives, including office supplies, a phone line, a computer, access to inventory data, product guides, and a login to your CRM system. In terms of training and general onboarding, it’s advisable to plan out the first 90 days of your new hire’s employment and monitor their activity during this time. Check in on them and offer ongoing coaching and support to ensure they’re well-acquainted with the product or service they’re trying to sell, who your customers are, your sales strategies, and business goals. Whatever onboarding process makes sense for your business and sales cycle, it should be repeatable, results-oriented, and structured. Traditionally, sales territories were geographical areas assigned to a sales rep or team. But now that so much of your sales activities can be handled remotely, it’s not always necessary to define your sales territory plan by physical locations. Of course, location-based territories are still an option if it makes the most sense for your company. Otherwise, you should feel free to define sales territories by more relevant characteristics, like customer type, industry, purchase history, referral source, product, or account size. Divide your current leads, prospects, and customers into relevant segments. This can be based on their location, vertical, or whatever trait is most relevant to your product, service, or sales process. Compare how different segments are making purchases. Are they buying online without much input from your team? Do they require extra nurturing to make a decision? Do they convert best after an in-person demo? Which solutions perform best with each segment? Where in the pipeline do conversions tend to stall, if anywhere? Conduct a simple SWOT analysis to determine your sales team’s strengths and weaknesses, as well as opportunities and threats to your territories. For instance, do some of your reps deliver better live sales demos than others? Which stage of the sales process is most challenging for your team? Is there an under-serviced customer type you should assign more reps to? Are there competitors fighting for customers in a particular vertical or location? Set practical targets for your team to works towards. What do you want to achieve? Why are you bothering to create or redefine your sales territories? Start by looking at your sales pipeline coverage to determine how many leads you need to ensure your reps meet quota. Make note of where your best leads are coming from, which products are the most profitable, and which customer type tends to have the highest lifetime value. Take what you know about your customer segments, your team’s abilities, and your sales targets to create a realistic territory plan. Define your territories and assign each rep to specific regions or markets. Think about how you can maximize coverage of high-value segments, match the right reps to the right type of territories, and ensure even distribution. Put your plan into action. Once you implement your new sales territory plan, it’s important to track your team’s activities and progress over time. This allows you to see whether the new territories improve or hinder your sales. Optimize and adjust territory division as needed. For example, if one territory is consistently outperforming the others, look for ways to replicate that success. If certain reps are failing to make quota, check that your territories are balanced to allow everyone on your team to succeed. How you structure your sales compensation plan also influences the type of talent you can attract and retain. There are three types of compensation structures to choose from. Reps are paid a straight salary, with no bonuses or potential compensation earned. This is not a very common choice as the salary needs to be quite competitive for this to work. Another drawback is that you don’t have the ability to motivate your team with bonuses. This works best for organizations where more than one sales rep or team member is involved in every sale. That is, no rep is solely responsible for a deal – so it wouldn’t make sense to offer bonuses to one person since every success belongs to the whole team. High-risk, high-reward. Since this structure is fully results-oriented, reps are only paid if they make a sale. An individual’s financial success is directly related to their ability to secure your business’ financial success. This structure might attract less interest from applicants, but those who do apply are likely dedicated, motivated, and competitive – which can be great traits for a sales rep, especially in certain environments. The most common compensation structure, this option provides reps with the security of a guaranteed base salary plus the motivation to sell more to earn more. It also avoids punishing reps for lulls in the market or discouraging them from taking time to learn and do professional development – because they’ll still get paid something either way. When choosing the best compensation structure for your sales team, there are a few basic rules to keep in mind. Your pay structure should be easy to understand. It doesn’t matter if you’re offering commission, bonuses, base salary, or some combination of all three – your payment structure shouldn’t be complicated. You need every rep to understand exactly what is expected of them and what they can do to earn a bonus. Avoid hard caps on bonuses and commission. If you put a cap how much a rep can potentially earn in a given period, you’re putting a cap on their motivation to sell. Instead, create an open-ended bonus structure that allow sales reps to maximize their earning potential – and your company’s sales. Don’t be afraid to change things up. When it comes to creating the perfect compensation structure, trial and error is part of the game. Try different combinations of salary, commission, and bonuses to find out what best motivates your team. In addition to offering competitive compensation packages, you can set sales quotas to motivate your sales team. Quotas are time-bound sales targets determined by management and assigned to specific territories or teams. They play a role in forecasting, help management monitor rep activity, and can even lead to improvements in the sales process. For example, if reps are consistently failing to meet certain activity-based quotas, there’s likely a weakness in your pipeline that needs to be addressed. Furthermore, sales quotas can help you assess when it’s time to expand your team and hire more reps.
You can choose to measure sales quotas by profit, sales, or rep activity over a given period. This is the most common type of sales quota. Reps must sell a minimum number of units or subscriptions to meet their revenue quota for a given period. Quotas can also be set based on daily, weekly, or monthly rep activities. For instance, they might be expected to make a certain number of cold calls every day, add a certain number of new leads to their list every week, or close a certain number of deals every month. These quotas are based on moving a certain amount of inventory over a given period. Typically, they’re assigned to the entire team for a longer period, like the quarter or year. Combination quotas bring together aspects of sales volume and rep activity to drive profit and increase your customer base. For instance, you might ask your sales reps to conduct ten sales demos and close 40% of those opportunities within a given period. How to Set Sales Quotas: Top-Down or Bottom-Up? Companies that use the top-down approach to sales quota start by setting high-level goals for the period and then create quotas to help them hit that goal. For example, if the company wants to earn $30,000 in this month and there are three sales reps on the team, then each rep would be assigned a monthly revenue quota of $10,000. This approach can also set activity quotas by looking at average deal size and asking each rep to close enough deals to bring in the desired amount of revenue. Continuing with the example above, if the average deal size is $1000, then each rep would be set a quota of ten new sales per month. The problem with this approach is that sales quotas tend to increase as average deal size increases – which can lead to unrealistic expectations as your company scales. Instead of working down from what management wants, the bottom-up approach to sales quotas starts with an understanding of what your sales reps are capable of achieving. The resulting quotas are often more motivational, balanced, and realistic than those set using the top-down approach. So, for example, you might look at how much each sales rep sold last quarter and then develop quotas that challenge and motivate them to do slightly better next quarter. You can also factor in average deal size to help you determine how much revenue you can reasonably expect of your reps.
Building your sales team is setting the foundation for the success of your business. When you’re first starting out, you want flexible, self-motivated reps who can drive growth and build your brand reputation. As your revenue grows and your business matures, you can look into bringing on specialists and help your current reps specialize to fulfill specific functions. Whatever stage your business is at and no matter how big your sales team, it’s important to provide your sales professionals with the tools they need to succeed – including a flexible CRM platform like Propeller. If you want to see how Propeller can save you time, increase productivity, and help generate more leads, why not start using it for free today?